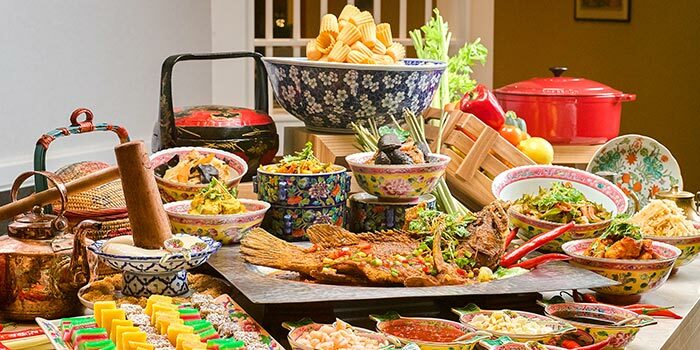 Think Peranakan cuisine, but bigger, bolder, and better. Step into a sanctuary where kings and queens feast. The space features pristine dining halls comprising three dining zones in a heritage-meets-contemporary style. The main dining hall is dressed in vibrant turquoise and accented with a sparkling diamond-cut glass wall feature, the lilac mezzanine is drenched in light through the restored stained-glass skylight, while in the classy dining room, the show kitchen's buffet lines take centre stage. 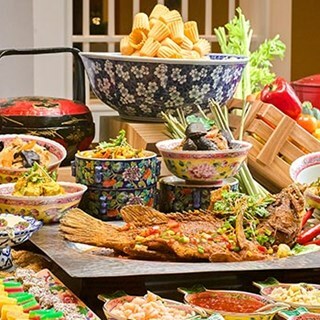 The restaurant offers a diverse buffet repertoire boasting a tantalising medley of Asian and international delights, with a spotlight on authentic Peranakan cuisine. Think evergreen favourites like Ayam Buah Keluak and Babi Pongteh, but with a splash of excitement through the restaurant's modern take on these classics. While you feast on these mouthwatering delights, remember to save some space for daily specials such as the Roast Beef and Leg of Lamb served up at the Carving Station. Other must-trys include the decadent Pork Belly La Mian, the rich and creamy Durian Pengat and the Traditional Muah Chee that's prepared a la minute. Now, here's a buffet you wouldn't want to miss! overall food quality was good, but abit disappointed as the lunch was from 12-3pm. Service staff started goiing around tables to clear up at 230pm. food from the buffet line was also being cleared away and during that time there were still many customers in the restuarant. The lady who helped out in the children's playroom was really nice to the kids and very friendly (pls let her know). Nice ambiance. Different options to choose. The durian counter was one of the best. The food selection was disappointing. 1) Crab was not fresh, the meat was flaky. 2) Slipper Lobster was not fresh and it tasted so hard. 3) There was no vegetarian selection. Because of this, I have to order from Ala-carte menu and pay for FULL BUFFET PRICE @ $64. Super not worth! 4) We were there to celebrate 2 family members' birthday. There was no initiative to offer a birthday cake nor offer wishes. Expected much better service than this! It will probably the last time that I will visit this restaurant. Super disappointed! Lack of drinks and serviettes, which I may relate it to controlling cost. Coffee, tea and serviettes are served when enquired. Would be good to provide simple drinks for us to self serve. Been coming here since 5 years ago and the standard of the food is still as good! :) Thank you! Enjoyed our weekend lunch here! Our servers Sherry and another lady were very pleasant and cleared our plates promptly. Love the spread of the food! Especially loved the laksa, durian penyat, cold dishes and desserts. Price is a little on the high side if without the hsbc (weekend 3 for 2 promo) though. 2. No field to indicate promotion to use, so stated in the special request section. But when received the confirmation email, it stated no promotion used. Panicked as I wanted to use the hsbc promo and wasn't sure if it will be honored. Sent clarification email but no response. But on the day, it was reflected in our bill, so i assumed it was noted. food varieties limited, not much choice. HSBC 1 for 1 is definitely a great way to enjoy the buffet. Went there, and after we sat down, realised that there was no korean chicken soup. Was disappointed as we had planned to celebrate my mother's birthday at Ellenborough due to the promotion. Midway through dinner, my mother found a small bug crawling out from her slipper lobster. Informed the waiter and the dish was brought away. Even though he seems apologetic, we at least expect the manager to apologise, and to offer some form of compensation. As we were celebrating my mother's birthday, we did not kick up a fuss. However, we left sorely disappointed due to the food hygiene and the service provided, as well as the misrepresentation. .
Great family place. We were there with 2 pre-schoolers and a 9-year old. They had space to safely expend their energy towards the end of dinner. Food was good. The durian pengat didn't fail to delight. The crayfish and kueh pai tee were good. The dessert shelf was enticing for the children. The 1-for-1 promo made it all worth the dinner gathering. Please add more free flow drink options such as coke, Sprite, minute maid, lemonade, etc. The rest are excellent. The range of complimentary drinks that come with the buffet is rather limited with only coffee, tea or water. It will be great if a wider selection of tea can be offered as part of the buffet. Other than that, everything is perfect. There weren't as many traditional peranakan dishes as expected, the seafood section was unexpected. The service staff was excellent, very prompt and attentive to diner’s need. It was a happy and nice dinner with nice food and service. I would definitely go back again. Smooth and efficient service from reception front desk to table. The service staff (man)  pouring wine for us is so polite and service-oriented.